I work part time as a reference librarian at my local library. I am so blessed to have a job that I love! One of the best parts of my job is ordering new books. Since I order all the non-fiction titles, I get to order quilt books! Here are a handful of the books I have ordered in the last year. The newest titles were already checked out! When I get back from Arizona, it will be time to begin ordering books for the next year. So my question to you is, what quilting/sewing book would you like to find on the shelf of your local library? I appreciate all of your suggestions. And just to thank those of you that are sticking through my not responding to comments while I am away, I have decided to bury a wee giveaway into this post. So when I get back home, I will draw a name from all those commenting on this post and that person will receive a mug rug made by me! Linking up with Free Motion by the River for Linky Tuesday. This entry was posted in Give Away, Uncategorized. Bookmark the permalink. hope you had fun in AZ. What a fun job to have. I love Paper Piecing. I would definitely look for one of these books in the library. Hello, I’ve found the name of that book on Australian quilts! It’s The Fabric Of Society: Australia’s Quilt Heritage From Convict Times to 1960 by Annette Gero. It looks as though it was self-published. We are kindred spirits. I’m a cataloger. I’d suggest one of the Lintott books. I like to be able to check out some of the latest books that have been published since I’m on a book diet so I can buy more fabric! How sweet of you! Thanks and God bless! Hello, I recently bought a book from Blue Underground Studios: Colorful Quilts for Fabric Lovers by Amy Walsh and Janine Burke. They have also published: In Love with Squares and Rectangles. They feature modern quilts. I’d recommend those books as the quilts are fairly easy to do and the authors show different color options for each quilt. I believe they also have chart for different sizes too. Perhaps also Quilted Planet: A Sourcebook Of Quilts From Around The World by Celia Eddy, published (in the UK?) in 2005 (but no patterns in there) or a book by Australian designers (Di Ford, for example or Sarah Fielke or Kathy Doughty) or about Australian quilts in general (but can’t think of a title at the moment) to see how they fare in relation to the American tradition of quilting! Our library system has four of Pam and Nicky Lintott’s quilting books on quilts made using jelly rolls or 2.5″ strips from your stash. I currently have all of them checked out, and am about to put the binding on one I made from their patterns. The books have beautiful quilts (I would like to make almost all of them!!). I plan to purchase at least one for my own collection-but which one??? I think my favorite is “Two from One Jelly Roll Quilts”. Each quilt is about 42 inches square and is a perfect size for a baby quilt. Have fun choosing what to order! That is part of the fun, too! Thank you for the giveaway. I have the book Makery Sewing and I love it. Thanks for posting these books. I have made a list and will look for those that look interesting in our library system. Librarians and quilters are two of my favorite groups of people, both of which are fairly devoted to helping others achieve their goals. As a former elementary teacher, I took enough summer school classes to earn 2/3 of a library science degree, so I call myself “a closet librarian”… And proud of it! In retirement, I enjoy quilting and reading, discussing books with a very active book club group. So funny allisonreidnem! That is the exact book I was going to say and I am based in Dublin so not too far from you. Do you recommend think big to buy? I don’t have it but I think a quilting book that you can make something quite quickly from would be best as you don’t have them for long. Here in the UK public libraries have been ‘re-vamped’ and are now called ‘discovery centres’! Sadly reference sections have shrunk to make way for computers and coffee machines 😕 Yes! I am turning into an old stick-in-the-mud! I’ve splashed out on a copy of Amy Ellis’ new book, Think Big, just waiting for the post to arrive… Hope a copy might find a way into your reference section! Enjoy the time with your family. Nancy Zieman A to Z is one of the best in my library. I’m with Donna, above. I cannot believe I didn’t think to stop at the library to look. I am taking the kids. They can get some fun books for them, and I will get some fun for me. It is great that you can order new books. I would love to see anything fresh and new in my library. My local library needs some good quilting books and I’d prefer anything with modern blocks or improve type of design. I do hope you’ll be visiting the higher altitudes of Arizona, so you’ll be staying in the cooler climate! Sew over it vintage by lisa comfort is a new one that looks quite good for sewing clothes and accessories. Sweetly stitched handmades by amy sinibaldi too. Since there’s an influx of new longarmers lately, I think any meaty instructional books on longarming would be appreciated. I have used libraries along my quilting life to learn basics in quilting or to further my journey in one technique or another. I’m going to check my local library to see if longarming has hit the shelves. Would be interesting to see if people have found them. Anyway, I also echo Bonnie Hunter’s books. They’re on my wishlist but I’ve been buying longarming books lol! I’ve been enjoying your pictures of your trip this week. I have to admit that picture of you standing on that arch gave me a shiver. I would love to be that fearless but the best I could probably manage if at all, is to be on my belly hugging the rocks! I liked Debbie’s idea of a book on string piecing – I want to do a Christmas string star and a Halloween string spider-web. Also a book on traditional log cabin quilts, because there are so many different settings. Fun to find out more about your day job….I’d recommend the FMQ books by Christina Cameli. How awesome. I assumed you were librarian at a school. Our library has a decent selection, and it seems to be slowly getting better. Our library has such an outdated collection of quilting books. I would love to be able to check out Freemotion Quilting by Angela Walters. Really anything published after 2005 would be great!! We have a fantastic library system here in Bellingham, WA. All libraries in the county are linked together and share books. I can request a book from another library and have it delivered to my library. They order in most any book I request, and of course most of them are quilt books! I have requested the Shape Workshop for Quilters and the Unconventional book. Four of the books in your pile are at my library. I am so thankful for the library! I haven’t purchased a quilt book in a long time so I won’t be much help. Have fun buying! What a fun job you have! I spent so much time at the library when I was growing up. Enjoy your visit with the wee ones. Travel safe. Would love to see quilting books by Bonnie Hunter and Kathy Brown. Although I have their books I know other quilters would really enjoy these books. Can’t say enough how wonderful these books are!!! Oh, and thanks for the giveaway. The library here as a very poor selection of quilt books, matter of fact I think they still have the same ones they had when I started quilting a long time ago, lol Enjoy those grandsons they are adorable! Splash of Color by Jackie Kunkel of Canton Village Quilt Works. For the past year or so I seam to be obsessed with black and white and can hardly wait for this one to come out! This sounds like a dream, fun job! How about a book on string piecing to expand the collection. I really enjoy your blog and the photos are just wonderful! I’m imagining that you live in a fabric world where someone else is cleaning, cooking, and buying groceries! Hahaha! Seriously, please keep sharing your thoughts, ideas and projects with us, your readers. I like it when you post your idea board that shows several ways to lay your blocks. I always agree with your final plan. Ha! And that builds my confidence as a quilter. Hope your day is filled with blessings! Hi, Katy; I really enjoy reading your posts. They give me some food for thought. 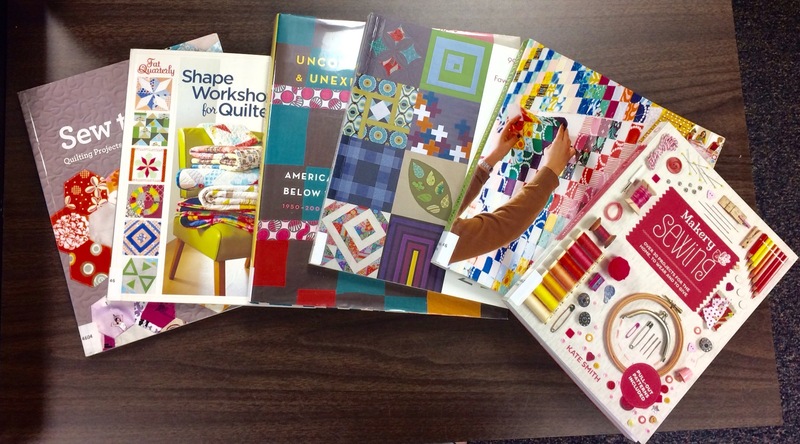 As to sewing-related library books, our library has a good selection of quilting and craft books, but not many of sewing/pattern-making books. I worked in our branch library at one time, and it was the best job I ever had. Why have I not thought of checking my library for quilt books? When I go to a quilt shop, I look for books that have simple designs or samplers, that have a treasure trove of traditional and modern blocks to choose from. I like reading about the history and meaning behind quilt block names and designs, too. Kathy Brown puts out nice books that have easy to follow instructions for cutting and piecing. Since I’m a beginner, those are the type I buy. I know Eleanor Burns put out a book to go along with the die cutters. Well, I could go on and on! I’m making a mental note to check my library! Thank you, Katy! I’d get Kaffe Fasset’s newest! Thank you for this giveaway Katy ! THat’s cheating, you know that don’t you. In answer to your question, ANY. Our library is great on cross stitch, detective stories and romance. Oh yes and the first two books only in any trilogy you’d care to mention. Anything else doesn’t seem to count. Have tried to get them to order in books for me but apparently there’s no demand. They fail to understand that getting the books people want will create a demand. In their defence they only have a small budget to play with each year and probably do the best they can with what they get. What a great job you have! And thanks for the wonderful giveaway!